Ayat Kursi, the Throne Verse (Arabic: آية الكرسي‎, translit. 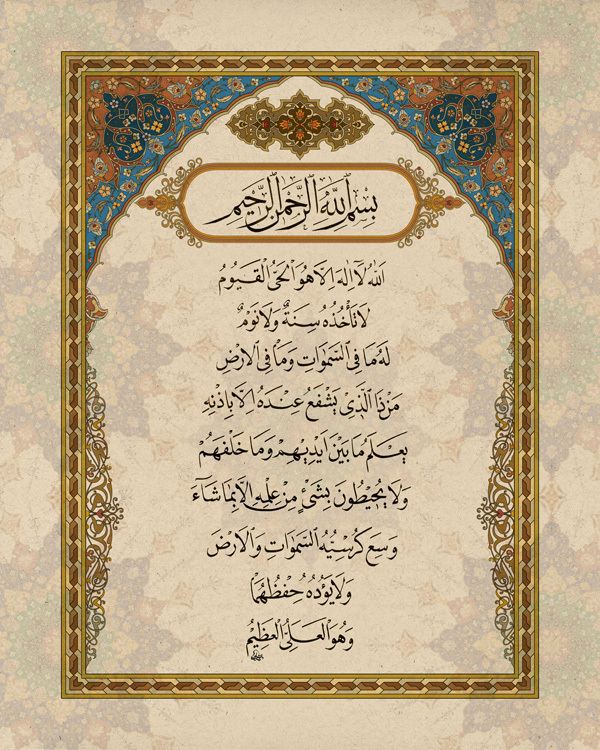 ʾĀyat al-Kursī‎), is the 255th verse of the 2nd surah of the Qur’an, Al-Baqarah. The verse speaks about how nothing and nobody is regarded to be comparable to God. It is perhaps the most well-known verse of the Qur’an and is widely memorized and displayed in the Islamic world. Allah, tidak ada Tuhan melainkan Dia yang Hidup Kekal lagi terus menerus mengurus (makhluk-Nya); tidak mengantuk dan tidak tertidur. Kepunyaan-Nya apa yang ada di langit dan di bumi. Siapakah yang dapat memberi syafaat (pertolongan) di sisi Allah tanpa izin-Nya? Allah mengetahui apa-apa yang di hadapan mereka dan di belakang mereka, sedang mereka tidak mengetahui apa-apa dari ilmu Allah melainkan apa yang dikehendaki-Nya. Kerajaan Allah (IlmuNya dan KekuasaanNya) meliputi langit dan bumi. Dan Allah tidak merasa berat memelihara keduanya, dan Allah Maha Tinggi (darjat kemuliaanNya), lagi Maha Besar (kekuasaanNya). 2.256: दीन में किसी तरह की जबरदस्ती नहीं क्योंकि हिदायत गुमराही से (अलग) ज़ाहिर हो चुकी तो जिस शख्स ने झूठे खुदाओं बुतों से इंकार किया और खुदा ही पर ईमान लाया तो उसने वो मज़बूत रस्सी पकड़ी है जो टूट ही नहीं सकती और ख़ुदा सब कुछ सुनता और जानता है . 2.257: ख़ुदा उन लोगों का सरपरस्त है जो ईमान ला चुके कि उन्हें (गुमराही की) तारीक़ियों से निकाल कर (हिदायत की) रौशनी में लाता है और जिन लोगों ने कुफ़्र इख्तेयार किया उनके सरपरस्त शैतान हैं कि उनको (ईमान की) रौशनी से निकाल कर (कुफ़्र की) तारीकियों में डाल देते हैं यही लोग तो जहन्नुमी हैं (और) यही उसमें हमेशा रहेंगे. Note: Some parts of sermon have not been translated to avoid repetition. Col. (retired) Munawar Ahmed Mir takes full responsibility for any errors or miscommunication in the translation of the Friday Sermon. Ayatul Kursi or the crown verse of the Holy Quran, begins with the word Allah and then throws light on His attributes. One may feel that the meaning of the whole verse is “Allah and only Allah,” which has always been flowing from the lips of our godly and spiritual personalities, i.e. Allah hi Allah, Allah hi Allah (Allah and only Allah). Nobody can deny that when a person, afflicted with a deadly disease, feels that no prayer or remedy is working, his spontaneous cry is “Oh Allah!” And the mere utterance of this word “Allah” proves to be effective in alleviating his misery. As far as I am concerned the word “Allah” is the most comprehensive prayer when compared with all other prayers. Thus, all the topics covered in Ayatul Kursi are subject to the word “Allah.” The Promised Messiah (as) has thrown abundant light on this. So during my sermon, wherever situation requires, I will quote the Promised Messiah (as) on the subject. Ayatul Kursi states that Allah is Ever-Living, Self-Subsisting and All-Sustaining, i.e., Al-Ĥayyu Al-Qayyūm: The word Al-Ĥayyu has been towed with the word Al-Qayyūm, meaning thereby that He is alive on His own, without any support. Al-Ĥayyu Al-Qayyūm naturally requires that it should be followed by َLā Ta’khudhuhu Sinatun Wa Lā Nawum, which means “He neither slumbers nor sleeps.” The One who is living without any support cannot feel sleepy. Inability to sleep, amongst human beings, is considered an ailment, not an asset. Sleep is needed to remove fatigue. But since God does not feel fatigue, he does not sleep. Slumber is the precursor of sleep. That is why it has been placed before Nawum (sleep). A tired person who cannot concentrate on the job at hand, tends to doze off i.e. slumber. Boredom, which is due to a lack of interest, also induces sleep. At times a person sitting in a company may feel bored even though he is not tired. In this case, his tendency to doze off is not due to fatigue but due to the lack of interest in the subject. So, interest in anything keeps one alive and keeps slumber away. Thus the overall meaning of “He neither slumbers nor sleeps” is that He takes interest in whatever He has created. If He dozes off, everything will come to naught. He cannot be unmindful of supporting the Universe for even a moment and this responsibility is not challenging for Allah since He does not have to exert effort to sustain the Universe. He does not slumber even for a moment, because He is always interested in His Creation, and He knows that His lack of interest in the Universe will mean its death. Our Universe is not the only Universe of which He is the Creator. Only Allah knows the number of Universes He has created. There is an Arab saying, al naum ukh tul maut, which means “sleep is the sister of death.” Death is a source of comfort for humans. Humans, when they get tired of their life-long work, desire for solace and death. For them, sleep is a kind of death, as in sleep, one gets relief albeit for a limited time. There are those people who come to me, who have come close to insanity and some of them have even become insane due to insomnia. At times, they even say to me that “pray for our death, because we cannot sleep.” In other words, they are saying that death is not coming, therefore pray for our death. Thus sleep and death are two sides of the same coin. So, if Allah is not overtaken by slumber, how can He sleep? Sleep is the other name of relief and solace, which a tired person needs. Allah does not tire. It is change that causes tiredness. Anything that does not undergo change does not get tired. No sane person can differ with the fact that human life is subject to continuous change and it is these changes that cause a person to wear out and to grow old. As they tire out, they head towards death, their ultimate destination. You should fully understand that there is no change in the Personage of God. To the degree that you consider God subject to change, you will place a constraint on God. Of course, since you cannot constrain His attributes, your understanding of God will come to naught. The greatest philosophical truth that has been described in this context is that: God is the First Cause of everything. Being so, He cannot be subject to change because if He is subject to change then He cannot be the First Cause. It is a complicated philosophical problem beyond the understanding of a common person, particularly for those people who have no interest in philosophy. However, the fact remains that anything which is subject to change can diminish with the passage of time. So God, not being subject to change, possesses permanent power. And His permanent power becomes the cause of permanent existence of this Universe. If one ponders over this verse, i.e. Ayatul Kursi, one gets surprised to discover how wonderful it is. Though the Personage of God is beyond the comprehension of the human mind, reflection on this verse will shed abundant light on His Personage. Lahu Mā Fī As-Samāwāti Wa Mā Fī Al-‘Arđi states that whatever is in the heavens and the earth, all belongs to Allah. This fact is a logical follow-up of the previous part of this verse, which states that Allah neither slumbers nor sleeps. Because everything belongs to Him, He neither slumbers nor sleeps. If He is to sustain His creation, He must remain alert and aware for without His vigilance His creation will perish. Ya`lamu Mā Bayna ‘Aydīhim Wa Mā Khalfahum, meaning that the people for whom intercession is destined and who are destined to be forgiven, their past as well as their future is fully known to God. One meaning that can be derived from intercession i.e. shafaat is that nothing is hidden from God. And those who are to be permitted to intercede, their past and future are fully known to Him. Mā Bayna ‘Aydīhim Wa Mā Khalfahum also states that “He knows what is (presently) before them and what will be after them.” This does not merely refer to humanity’s past, present, and future, but also relates to the past, present and future of the whole universe. Do we find ourselves today in the same situation in which Akbar found himself? Akbar wrote this couplet a very long time ago, but it holds more truth today than it did in his day. It is a fact that never before in human history, has atheism entrenched itself so firmly on our planet. It is therefore of absolute importance to highlight the meanings of Ayatul Kursi. It is in this age that the Promised Messiah (as) has made scholarly commentary on Ayatul Kursi, both in writing and in discourse, which are recorded in Malfoozat. Now I will place before you a hadith. Hadhrat Ibn-Isqah-ha (ra) relates that he heard the Holy Prophet (saw) saying that somebody asked him as to which is the greatest verse of the Holy Quran. The Holy Prophet (saw) replied. Allāhu Lā ‘Ilāha ‘Illā Huwa Al-Ĥayyu Al-Qayyūm Lā Ta’khudhuhu Sinatun Wa Lā Nawmun. Similarly Abu Hurairah (ra) relates that the Holy Prophet (saw) said that everything has a top and the top of the Quran is Surah Al-Baqarah and in it there is the greatest verse which is the head of all verses of Quran and that is the Ayatul Kursi or the Crown verse. The Holy Prophet (saw) used to observe his companions with such keen observation that he even knew about many of his companions as to which parts of Quran they had learned by heart. The companions also used to take pride in the fact that the Holy Prophet (saw) knew as to how much Quran they had learnt by heart. It appears that they used to keep the Holy Prophet (saw) informed about their progress in remembering Quran because they believed that by doing so they will be blessed in learning more Quran. The Holy Prophet (saw) again said, “Which is the greatest verse in rank amongst the portions of Quran you remember?” It looks that by doing so the Holy Prophet (saw) was giving a cue to him as one gives cue in solving riddles. Abu Manzar spontaneously replied “Allāhu Lā ‘Ilāha ‘Illā Huwa Al-Ĥayyu Al-Qayyūm. Undoubtedly, amongst the portions of Quran I remember, this is the greatest verse.” After this Holy Prophet (saw) patted his chest and said, “O Abu Manzar, may knowledge be a blessing for you. This verse i.e. Ayatul Kursi is the fountainhead of knowledge.” Thus the Holy Prophet (saw) indicated to Abu Manzar that he should keep pondering over this verse and God will thus bless him with abundant knowledge. Now I will explain the two attributes, Al-Ĥayyu Al-Qayyūm, by quoting from excerpts of the Promised Messiah’s writing. The Promised Messiah (as) says, “We should know that Quran has presented two names of Allah i.e., Al-Ĥayyu and Al-Qayyūm. Al Hayye means the Ever-Living and the Constant Support of life in the universe. Al-Qayyūm means SelfSubsisting and All-Sustaining.” How did the Promised Messiah (as) arrive at these meanings? It is because both these words come after “Allah is One, who is Ever-Living.” If there exists anything else in the universe which is living, it is only because He has given it life. The Promised Messiah (as) has provided us with the insight that Al-Ĥayyu means not only the Ever Living, but also the One who gives life. Then he says AlQayyūm: the Self-Subsisting and All-Sustaining. Just as in the case of Al-Ĥayyu, AlQayyūm has a two-fold meaning as well. It does not only mean Self-Subsisting but also means All-Sustaining. Everything owes its existence, both external and internal, to these two attributes of God. The external alone is visible to us whereas the knowledge of internal rests with Allah alone. But the sustenance of the existence of both, depend on Allah’s will. The Promised Messiah’s commentary contains all these meanings. It is difficult for common person to understand it, because it requires a lot of patience and time to delve deep into its meanings. Iyyaaka nasta- ‘iin: Thee alone do we beseech for help.” Only with God’s special favors can one understand the mutual relationship between these attributes of God and the prayers found in Surah Fatihah. Surely, Allah had bestowed this special favor upon the Promised Messiah (as), who shared it with us in brief. Our job is to study this relationship in depth in order to acquire a true understanding of it. The Promised Messiah (as) says that the attribute Al-Ĥayyu (The Ever-Living and Constant Support of everything) demands that Allah be worshipped. How does Ĥayyu relate to worship? One of its interpretations is that a servant has nothing of his own. His life depends on the will of his master. There may be servants in the world that can run away and take care of their needs from another source. But it is not possible for Allah’s servants, whether they are spiritually attuned to Him or not, to survive without Him, as He alone is the source of all life. Throughout the world, scientists are striving towards maximizing food production and making great scientific discoveries towards that end, in the hope of solving the food problems of humanity. But the treasure of food is bestowed by Allah. Thus, whether their striving is accompanied by this admission or not, there is no other source from which they will acquire it, save from Allah. Hence the cry Iyyaaka na’-budu is instinctively issuing forth from their hearts. But the unfortunate ones, being devoid of spirituality, fail to grasp the meaning of these words. Now when we say that Surah Fatihah is the mother of Quran and within its verses resides the whole of the Quran, then how can we claim that Ayatul Kursi is the highest in rank? It is because the heart of the Ayatul Kursi ultimately resides in Surah Fatihah. Thus, the Ayatul Kursi is not a rival of Surah Fatihah. Surah Fatihah is indeed life giving and Ayatul Kursi draws its life from it. The essence of all subjects covered in the Ayatul Kursi is also found in Surah Fatihah. So, do not presume them to be in oppositional ranks. When the Promised Messiah (as) at some places refers to Surah Fatihah as everything and elsewhere refers to Ayatul Kursi as everything, there is no contradiction in such statements. The key to understanding this fact resides in understanding Iyyaaka na’-budu, wa Iyyaaka nasta-‘iin. The Promised Messiah (as) teaches us that the divine attribute of Al-Qayyūm articulates the truth that all support must be sought from God, because nothing can exist without His support. Once life is granted, its maintenance also requires support. That support is expressed in the divine attribute of Al- Qayyūm (Self-Subsisting and All-Sustaining). The second expression of Qayyūm, i.e. All-Sustaining, is found in the words Iyyaaka nasta-‘iin: “Thee alone do we beseech for help,” which encompasses a broader meaning, which is: “We desire life from You because except You nobody else can give life and the span and quality of this life is entirely dependent on Your Will.” Thus, the prayer Iyyaaka nasta-‘iin, invokes the Divine attribute of Qayyūm, and through this prayer one seeks the All-encompassing Support of God. In his writings, the Promised Messiah (as) draws our attention to the fact that whosoever steadfastly supplicates to Allah, becomes a true seeker. All Muslims who offer prayers do recite Surah Fatihah in every prayer many times over, but they do not try to understand its meanings while reciting it. Thus, he states, they do not realize that Support does exist, but one must ask for it and the more one asks for it, the more it is granted. All our progress depends upon our seeking support from that Eternal Support. I will shed some light on the subject, Lā Ta’khudhuhu Sinatun Wa Lā Nawmun: “Neither slumber nor sleep seizes Him,” with reference to the Promised Messiah’s writings. The Promised Messiah (as) describes the deep relationship between ownership and slumber and sleep. The real existence, real immortality and permanence and all other true attributes belong to God. He has no partner. He is Ever-Living, and everything else gets life and sustenance from Him. He is Self-Subsisting and All-Sustaining, thus death cannot overtake Him and therefore the slightest suspension of any of His attributes is not permitted (jaiz). The word permitted (jaiz) does not connote an externally imposed Shariah for God, which determines what is permissible for Him and what is not. If we study it in depth, we find that the Shariah is in itself an expression of God’s attributes. Thus Allah’s attributes are not subject to suspension, even to the slightest degree. I have explained this before. Whatever you see in the heavens and earth, all belong to Him. Everything is created and sustained by Him. He alone is the Master, and no being other than Him can truly be Master: “Who is it that can intercede with Him, except by His permission, He knows what is before and what will be after them,” i.e. His knowledge encompasses past, present and future, seen as well as unseen, including whatever is unknown to people whether about themselves or about external world. Now I place before you an excerpt from Promised Messiah’s (as) writing, i.e., his commentary on this verse: “Allāhu Lā ‘Ilāha ‘Illā Huwa Al-Ĥayyu Al-Qayyūm Lā Ta’khudhuhu Sinatun Wa Lā Nawmun Lahu Mā Fī As-Samāwāti Wa Mā Fī Al-‘Arđi.” He said, “Now we should see with complete impartiality that how eloquently, elegantly, and with what gravity and wisdom, the existence of a Creator of the universe has been expounded in this verse.” I had said in the beginning that due to ignorance and lack of education, our era has become an era of atheism, but the arguments cited in this verse, cannot be refuted. There can be no rebuttal to them. The Promised Messiah (as) writes that divine argument provided in Ayatul Kursi are eloquent and dignified. If one ponders over these divine arguments, one can grasp its meanings. Ayatul Kursi has expounded the Greatest and the First Cause i.e. God, in so few words. You cannot find any parallel to this in the universe. La Hu Mā Fī As-Samāwāti Wa Mā Fī Al-‘Arđ: “To Him belongs whatever is in the heavens and whatever is on the earth” has given such strong argument to prove the existence of a Creator of this universe that no scholar has been able to contest it. This portion of Ayatul Kursi implies that philosophers have failed to comprehend the true cause of Creation. These philosophers, for example, have not been able to fully appreciate that the body and the soul have been created. They do not even know how the body is created. These philosophers remain ignorant of the subtle secret that real existence, real being, and real permanence can only be ascribed to God. This argument needs further explanation. I’ll explain it in the next 2-3 minutes left in the sermon. The Promised Messiah (as) says “In reality, life and permanence belong to Allah alone, who is Possessor of the Perfect attributes, except Him, nobody possesses these attributes. From this fact the argument of the need for a Creator is deduced.” Created is one which occurs and is not everlasting. If a thing that occurs is highly complicated and has depth in its structure and an excellent scheme in its being, it cannot occur on its own. It must have a Creator. Thus it follows that the whole universe has been created, which means that before its creation, it did not exist. If it did not exist before and now having come into existence one finds in it structure, order, and intricacy, then it logically necessitates the existence of some Intelligent Being who understands all those things which are found in His Creation. Otherwise, without understanding them, He could not have made it accordingly. Only a great painter can understand paintings. A casual observer cannot fully comprehend the import of a painting. The message behind the painting may be very deep. Sometimes, in art galleries, some people pass the whole day sitting in front of one painting, trying to understand the message it wants to convey. Passersby wonder as to why such people are sitting there. They fail to note that what one can understand by carrying out a deep study of the painting, cannot be understood by just casting a cursory glance over it. In this connection, I will tell you of an intellectual, who has a deep relationship with this topic. But there is no time left. God willing, in the next sermon, I will try to cover the remainder of this topic. Dalam ayat ini Allah swt. menjelaskan bahwa Dia adalah Tuhan Yang Maha Esa dan tidak ada Tuhan selain Dia, hanya Dia sajalah yang berhak disembah. Adapun tuhan-tuhan yang lain yang disembah oleh sebagian manusia dengan alasan yang tidak benar memang banyak jumlahnya. Akan tetapi Tuhan yang sebenarnya hanyalah Allah semata-mata. Hanya Dialah Yang Hidup abadi, yang ada dengan sendiri-Nya dan Dia pulalah yang selalu mengatur makhluk-Nya tanpa ada kelalaian sedikit pun. Kemudian ditegaskan lagi bahwa Allah swt. tidak pernah mengantuk. Orang yang berada dalam keadaan mengantuk tentu hilang kesadarannya sehingga ia tidak akan dapat melakukan pekerjaannya dengan baik padahal Allah swt. senantiasa mengurus dan memelihara makhluk-Nya dengan baik, tidak pernah kehilangan kesadaran atau pun lalai. Karena Allah swt. tidak pernah mengantuk, sudah tentu Ia tidak pernah tidur karena mengantuk adalah permulaan dari proses tidur. Dan orang yang tidur lebih banyak kehilangan kesadaran daripada orang yang mengantuk. Sifat Allah yang lain yang disebutkan dalam ayat ini ialah bahwa Dialah yang mempunyai kekuasaan dan yang memiliki apa yang ada di langit dan di bumi. Dialah yang mempunyai kekuatan dan kekuasaan yang tak terbatas sehingga Dia dapat berbuat apa yang dikehendaki-Nya. Semuanya ada dalam kekuasaan-Nya sehingga tidak ada suatu pun dari makhluk-Nya meskipun nabi-nabi dan para malaikat dapat memberikan pertolongan kecuali dengan izin-Nya apalagi patung-patung yang oleh orang-orang kafir dianggap sebagai penolong-penolong mereka. Yang dimaksud dengan “pertolongan” atau “syafaat” dalam ayat ini ialah pertolongan yang diberikan oleh nabi kepada umatnya di hari kiamat untuk mendapatkan keringanan atau kebebasan dari hukuman Allah. Syafaat itu hanyalah akan berhasil apabila Allah memerintahkannya atau mengizinkannya. Sifat Allah yang lain yang disebutkan dalam ayat ini ialah bahwa Allah senantiasa mengetahui apa saja yang terjadi di hadapan dan di belakang makhluk-Nya, sedang mereka tidak mengetahui sesuatupun dari ilmu Allah, melainkan sekedar apa yang dikehendaki-Nya untuk mereka ketahui. Kursi Allah (yaitu ilmu dan kekuasaan-Nya) meliputi langit dan bumi. Dan Allah tiada merasa berat sedikit pun dalam memelihara makhluk-Nya yang berada di langit dan di bumi, dan di semua alam ciptaan-Nya. Allah Maha Tinggi lagi Maha Besar. 1. Our Holy prophet (SAW) has said: whoever recites the first 4 ayats of Surah Baqarah, then Ayatul Kursi and then the last 3 ayats of Surah Baqarah will not be inflicted with any kind of difficulty in his wealth or himself, Shaitaan will not come near him and he will not forget the Qur’an. 2. Imam Ali (AS) was told by our Holy Prophet: Qur’an is a great word, and Surae Baqarah is the leader of the Qur’an and Ayatul Kursi is the leader of Surae Baqarah. In Ayatul Kursi there are 50 words and for each word there are 50 blessings and good in it. 4. If one ties this to ones wealth or chidren, they will be safe from Shaitaan. 5. Our Holy Prophet (SAWW) has said: These things increase ones memory; sweets, meat of an animal near the neck, Adas (Lentils), cold bread and recitation of Ayatul Kursi. 6. For those of our dear ones who have passed away, recitation of Ayatul Kursi and giving it as Hadiya to them, gives them light (noor) in the grave. 9. The Holy Prophet (saw) has said: If one recites Ayatul Kursi before going to sleep, Allah will send an Angel to come and look after you and protect you till the morning. His home, family and also neighbours will remain in safety until morning. 10. When one is alone in the home, recitation of Ayatul Kursi and asking Allah to help will make you remain calm and you will not fear. 11. The Holy Prophet has said: When leaving home,if one recites Ayatul Kursi the Allah will send 70,000 Angels to do Istighfaar for him until he returns home, and upon his return Poverty will be removed from him. 12. If one recites this after doing Wudhoo, the 5th Imam (AS) has said: Allah will give him a reward of 40 years of Ibadaat, his position will be raised in the Heavens 40 times (levels) and will marry him to 40 Horains. 13. One who recites it after every prayer, thier salaat will be accepted, they will remain in the safety of the Almighty and He will protect them. 14. Allah (SWT) told P.Musa (AS): If one recites it after every salaat, the Almighty will make his heart a thankful one (Shakireen), will give him a reward of the prophets, and his deeds will be like those of the truthful (Siddiqeen) and nothing except death will stop will stop him from going into heaven. 15. To increase light or vision (noor) in the eyes, recite Surae Alhamd once, then Ayatul Kursi and then once the following dua:- “U-eedhu nora basaree binuril lahi alladhi la yutfaa”, “I seek refuge for the light of my eyes by the light of Allah (SWT), which does not become extinguished”. 1) Hazrat Ali bin Kaab r.a. remarks that Nabi s.a.w. asked him,” Which is the most high ranking Ayat in the Qur’an Kareem?” He said, ” Allah and His Rasul know best”. Rasulullah repeated this statement very often. Hazrat Ali r.a. stated, “Ayatul Kursi”. Nabi (Sallallahu alayhi wasallam) said:”Oh Abul Munzar (family name of Abi bin Kaab). May you be blessed by this knowledge. I swear by that Being in whose Hands and Control is my life, that this Ayat has one tongue and two lips. It is by the threshold of Allaah’s Arsh, Mentioning His purity”. 3) It is reported from Hazrat Askee Baqri that Nabi s.a.w. came to the abode of the Muhajreen when one person asked, “In the Qur’an Kareem which is the most lofty Ayat?” Nabi s.a.w. repeated “Ayatul Kursi”. 4) Hazrat Hassan reports “Marfoonaan”,” I have been given Ayatul Kursi. Nabi s.a.w. said,” Surah Fateha, Ayatul Kursi and the two Ayats of Al-Imraan (Shaheedal Allaah – 18th Ayat), and “Qul Allaahumma Malekal mulk til Bi Ghairi Hisaab (Ayat 26/7) are attached to the Arsh and say, “Oh our Rabb, You are sending us onto earth to disobedient ones! Allah says ,” I have given you such status, whosoever from amongst my servants recites you after every Salat, his resting place will be Jannah. And I will make his abode in Jannatul Quddoos and fulfill 70 needs of his daily needs, the least of which is forgiving him and saving him from all enemies of evils. 6) Hazrat Anas r.a. said that Nabi s.a.w. said, “The one who recites Ayatul Kursi after every Fardu Salah will be protected until the next Salah and this is constantly done by a Nabi or a Siddiq or a martyr. 8) Hazrat Anas r.a. says: Rasulallah s.a.w. asked; “Do you know which Ayat in the Qur’an is most lofty? ” I said, Allah and his Rasul know more.” Nabi s.a.w. read Ayatul Kursi. 9) Hazrat Efai bin Abdullah Kallee said that one person asked.”Oh Rasulallah s.a.w., which Ayat in the Qur’aan is the most lofty one?” Nabi s.a.w. said: “Ayatul Kursi”. The person asked, “Which Ayat has those benefits which you desire for your Ummah, in the Qur’an?” Nabi s.a.w. said: “The last Ayat of Surah Baqarah, for it is from the treasures of Allah from underneath the threshold of the Arsh. It encompasses all the good of this world and the Akhirat”. 10) Hazrat Muhammad bin al Saumi bin Al Salsal bin Damasc narrates from his father, who in turn, narrates from his father that Rasulallaah s.a.w. said: ” Whoever recites Ayatul Kursi after every Fardu Salah, there is only death between him and Jannat”, he will enter into Jannah immediately when he dies. 11) Hazrat Ibne Anas r.a. says that Rasulallaah s.a.w. said: “The one who recites Ayatul Kursi after every Fardu Salah, Allah Ta’ala will grant him a gratifying heart, actions of the truthful and reward like the Ambiyaa. Special mercies will descend upon him, and death is the only barrier from his entrance into Jannah. On dying he will enter Janaat”. 13) Hazrat Ibn Masood r.a. says that Allah s.a.w. did not create any thing in the skies or on earth, in Jannah or Jahannam, loftier than Ayatul Kursi. 14) Hazrat Ibn Masood r.a. says that no space in the sky, or on the earth is loftier than Ayatul Kursi. 15) Hazrat Masood r.a. states that a person left his home and met a Jinn on the way. The Jinn asked him, “Can you drop me down? If you do so, then I will teach you such an Ayat that if you recite it upon entering your home, Satan will not enter.” They wrestled and the person dropped the Jinn down. The Jinn said: “Read Ayatul Kursi, because that person who recites it upon entering the home, Shaitan flees like a donkey making a sound from its posterior runs away. A person mentioned to Hazrat Ibn Masood that the person (who dropped the Jinn) could only be Hazrat Umar r.a.
Hazrat Abu Hurairah r.a. narrates this (above) Hadith from Rasulallaah s.a.w., with the addition that there is an Ayat in Surah Baqarah, which is the chief Ayat of the Qur’an. Whosoever recites it in a house wherein Shaitan is, he (Shaitan) will leave. 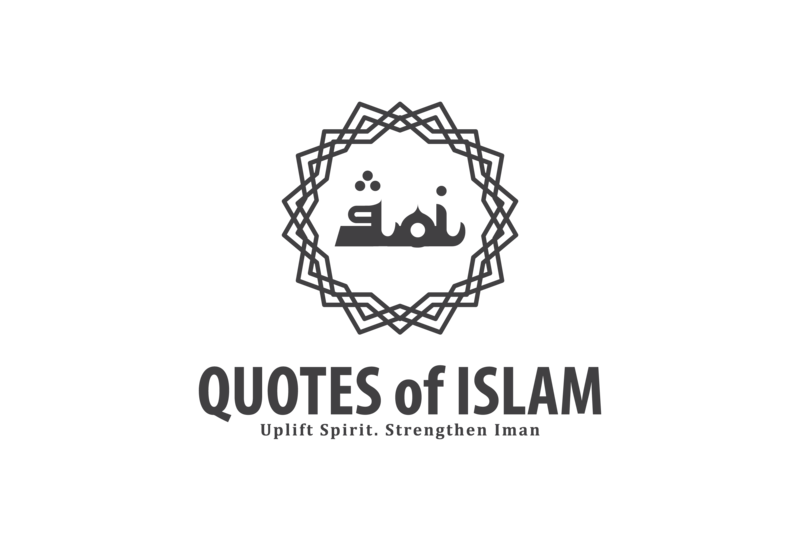 17) Hadhrat Ibn Umar r.a. narrates that once Hadhrat Umar r.a. came to the people and said, “Who amongst you can tell me which is the most lofty Ayat in the Qur’aan, which Ayat directs one most towards justice and fairness, which Ayat creates the most fear and which Ayat creates hope for mercy?” All remained silent. “Hadhrat Ibn Masood r.a. said,”I heard Rasulallaah s.a.w. say from the Mimbar (pulpit) that Aayatul Kursi is the Loftiest in the Qur’aan, and the Ayat which encourages justice and fairness is ( Arabic P12) and the Ayat that creates the most fear is ( Arabic P12) of the Ayat that creates the most hope of mercy is ( Arabic P12). 18) Hadhrat Ibn Abbas r.a. said that when Rasulallaah (Sallallahu alayhi wasallam) recited the last Ayat of Surah Baqarah and Ayatul Kursi then he laughed and said,” These have come from the treasures of Allaah.” and when he read (May Ya’mal Soo), then he said (Inna li llaah…) and chose humility and meekness. 19) It is reported that when ever Hadhrat Abdur Rahman Bin Auf r.a. entered his home, he used to recite Ayatul Kursi in its corners. 31) Hadhrat Abu Zar (Radiahallahu Anhu) says that he asked Rasulallaah (Sallallahu alayhi wasallam) which was the most (Arabic) (lofty, respectable) Ayat revealed to you? Nabi (Sallallahu alayhi wasallam) replied, “Ayatul Kursi”. 34) Hadhrat Abu Amama (Radiahallahu Anhu) says he asked Rasulallaah (Sallallahu alayhi wasallam),”Which is the most respectable, lofty Ayat, which has descended upon you”. He said, “Ayatul Kursi”.